Are you tired of constantly replacing your slippers because the lose their support and comfort? 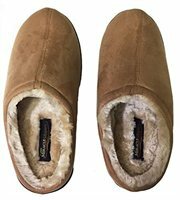 It’s difficult to find a good pair of slippers that hold their shape and are machine washable for consistent use. Most slippers aren’t comfortable enough to do household chores in for long periods of time either! Miracle Slippers are the solution! Miracle Slippers feature a cushy soft gel insole and hard soles so they relieve joint pressure while walking and standing! Faux fur lining gives added comfort. These gel slippers are made from a soft microfiber and are machine washable.